Yesterday was a "be comfy" day. And when I had to go out and run some errands, I wrapped myself in my newest camel check scarf and decided to clash it with my check coat from last winter. Not the best combination as I'd hoped but I still think it looked okay. I wore a simple outfit underneath - my fave easy jumper from H&M with jeans and my newest winter boots. I picked out the pastel pink from my jumper and brought that colour into socks and my hat to brighten up the outfit so it wouldn't look so dark. It's almost winter, and it is colder - but not enough to be covered in black all day long! 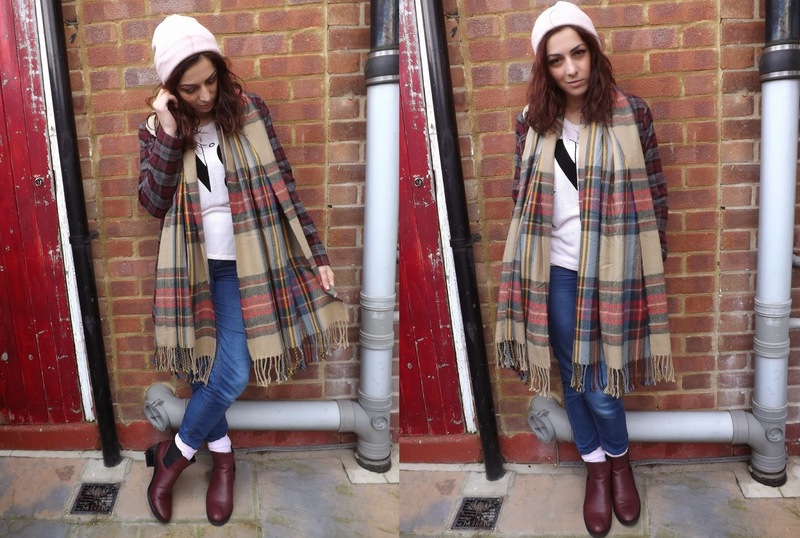 Plus, I think the pastel pink really bought out the autumnal colours in my scarf, coat and shoes! I think I pulled together a weird outfit here, but I quite like the quirky touch. Love this look, perfection :) that scarf looks so cosy! love this super autumnal look. looks stunning!